Wasn't or isn't there a thread which lists the engine numbers for various years and the frame numbers too. I want to copy it so I'll have the info if needed..can anyone direct me to the post or repost the info..
Found Randall's list from 75 to 77 but what about 78 to ??? EDIT: all links referenced here are now dead, deleted them. Thanks guys that covers most of it...here's a summary in case anyone cares..
1975 K0 The frame serial number began GL1-1000012 while the engine serial number began GL1E-1000001. 1976 The frame serial number began GL1-2001483 while the engine serial number began GL1E-2001422. 1980 The frame serial number began SC02-2000040 and the engine serial number began SC02E-2000047. 1981 The frame serial number began with the new style used throughout the motorcycle industry and common to the automotive industry: 1HFSC0207BA100001 and the engine serial number began SC02E-2100002. 1982 The frame serial number began with 1HFSC0205CA200101 and the engine serial number began SC02E-2200028. 1983 The frame serial number began with 1HFSC020XDA300101 and the engine serial number began SC02E-2300012. 1984 # The frame serial number in California began 1HFSC1431EA000001 while in the rest of the U.S. it began 1HFSC1401EA000001. 1988 The frame serial number (i.e., VIN) for Japanese made Wings for California began: JH2SC2217JM000001 and for the rest of the U.S. began: JH2SC2208JM000001. The frame serial number (i.e., VIN) for American made Wings for California began: 1HFSC2217JA000001 and for the rest of the U.S. began: 1HFSC2208JA000001. The engine numbers whether made for California or the rest of the U.S. (all made in Japan) began: SC22E- 2000101. # The engine serial number (for both California and the rest of the U.S.) began: SC14E-2400107. 1989 The VIN number for California began: 1HFSC220*KA100001 while the rest of the U.S. models began: 1HFSC221*KA100001. (The * is a control checksum number). The engine numbers began SC22E- 2100101. 1990 The VIN number for California began: 1HFSC220*LA200001 while the rest of the U.S. models began: 1HFSC221*LA200001. (The * is a control checksum number). The engine numbers began SC22E-2200101. Does anybody know if all the 1980 1100's we're made in the US or at what serial # they started making them in the US. My 80 is early 80 (I can't tell whether 1 or 3/80) and is made in Japan. According to the Goldwing history production started in the USA in May 1980. Is it possible that 1983 model hax short ( 11 digit) vin ? Thanks for the bump. I have this number and it does not seem to match anything in this list. Could this be a replacement motor due to warranty way back when? 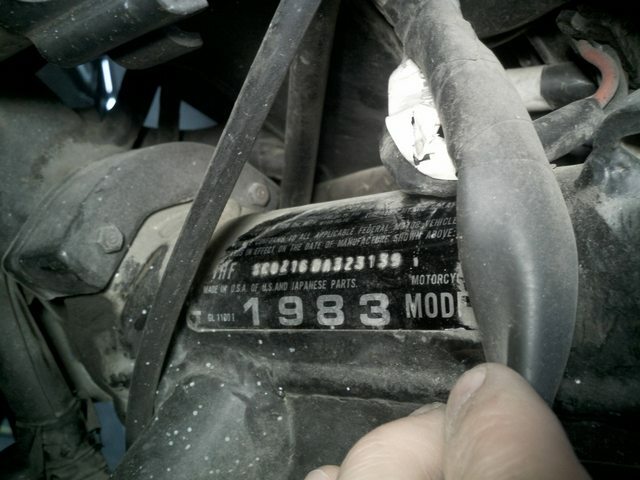 I'm also curious, I'm buying a gl1100 interstate with the vin sc02168a323139 but the owner is claiming its an '83. If the 6th digit is year, that put the frame as an '86 but of course that's not right. I thought all post 78s were required to have a 17 digit long VIN. Am I way off? You forgot the 1HF that is common to all VIN's and that would give you the 17 digits. It is not embossed but is part of the VIN.